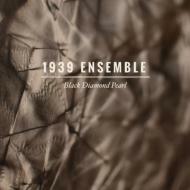 For their 2015 sophomore album, 1939 Ensemble added a third member, multi-instrumentalist Josh Thomas, whose musicality adds a rich Ostinato to Medeles and Coniglio's dialogue. The band put together a dream team to help build the record, including John McEntire, Tucker Martine, Mark Orton, Holland Andrews, M. Ward and Michael Flinn. Black Diamond Pearl is a journey, cinematic in nature and ranging the full spectrum of emotion - a puckish romp in vivid colors, a bright trumpet peppering the ebullient rhythms, percussion-heavy songs acting as exercises in tom work, penetrating brass, ethereal vocals (provided by Like A Villian's Holland Andrews), and industrial noise.